It’s not that a lot of us don’t think, it’s that we think and, then react to that thought too quickly. At this point, our proven plan goes through the window. Reaction: You get in, even though your signal hasn’t developed. Reaction: You end up getting in the trade with too big of a position size, and/or when you’re proven wrong, you won’t cut your losses. As you can see, this habit of blind reaction can get you into trouble. It’s a pattern of mind that needs to be changed, and thanks to neuroplasticity, that change is possible, much faster than you’d imagine. 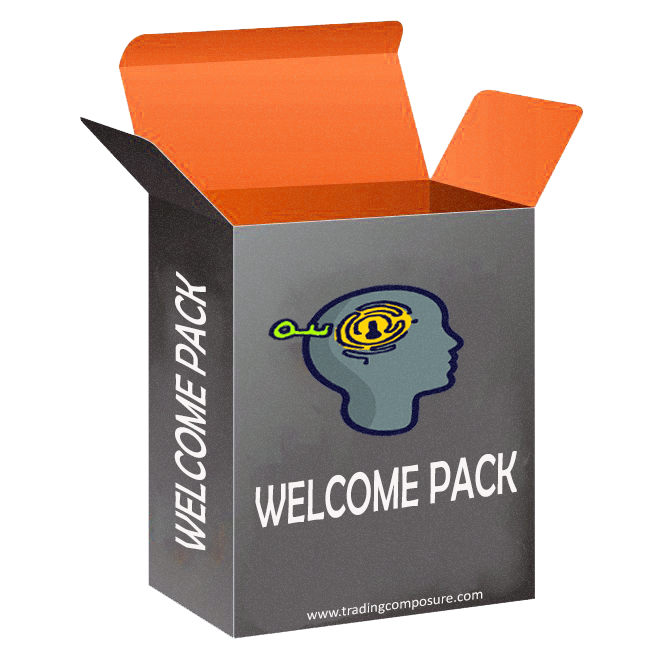 Science is very clear about this: Our minds (not the brain itself but the layers of learned or inherited habits and intricate patterns that make you who YOU are) are continuously changing. The brain (which hosts the mind) is constantly creating or strengthening neural pathways according to how it’s being used. This is called Neuroplasticity. 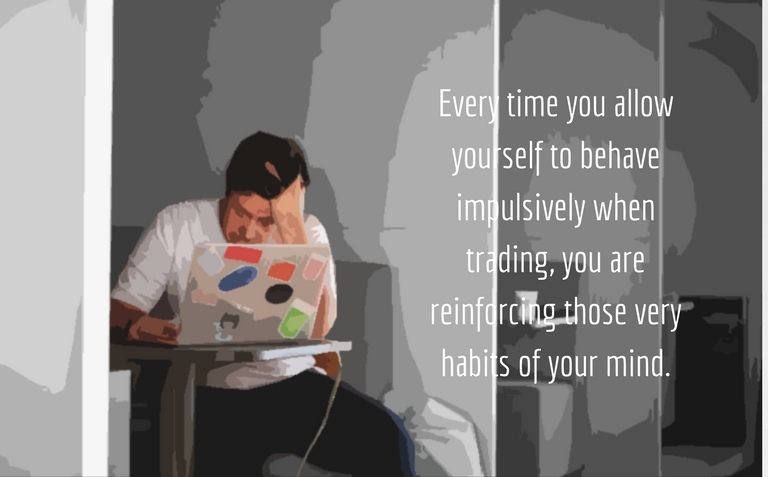 More simply, this is what it means: Every time you are being impulsive in the markets; every time you are acting out mindlessly, you are essentially reinforcing those very habits of the mind. Conversely, every time you are calm, cool, collect; every time you’re cultivating perspective so that you can follow your plan, those are the habits of mind you are reinforcing. Impulsivity and short-sightedness, then, fall by the sideway. That’s it. Since your behavior defines who you are, that’s the story of what makes you, YOU, in a nutshell. But, how can I start working on becoming a better me? Since we’re talking about impulsivity in trading, how can one start doing the right things which will create a snowball effect and eventually make such behavior more and more natural? Well… since you know that my goal here at Trading Composure is to skip all the useless talks and go directly to the practical, here’s a 3 simple step solution that actually works! One major problem with our long-term goal setting is its vagueness. 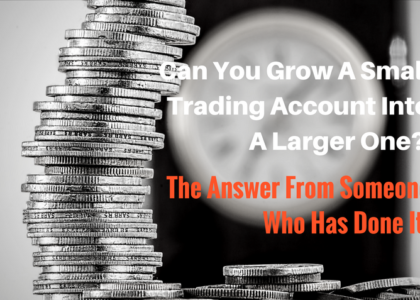 While you’re able to imagine in your mind being successful as trader in the future and earning a consistent income, in general, this is just an overall picture. The exact details of how you’re going to get there is not clear enough. What I’m saying here is that you need a more detailed depiction of that ideal future you’re envisioning, so that it isn’t fuzzy. Fuzziness can make the future less appealing in the short-term. For you to follow your plan, as it is, you need to hold in your mind, as vivid, as colorful, and as detailed as possible your long-term goal. For instance, I’m sure you’ve heard about the marshmallow experiment that was first conducted in the late 1960s. Nowadays, there’s been a lot of reiterations of that same experiments as you can see in the video below. But, in one of them, the kids were actually shown the 2nd marshmallow while being told that they would get to eat it if they waited and didn’t eat the first one on the table. The outcome was this: A good 80% of them waited, which is to say, they didn’t eat the one on the table. They had an easier time resisting the urge because they had a clear picture of what was waiting for them in the future, if they waited. This is very important: Work on making the future less fuzzy by focusing on the details – when you think of your longer-term goals, be specific, vivid, and as detailed as possible. Picture how you’re going to get there and how it’s going to be like. That future has to be palpable! The key to curbing impulsivity is to create some space between your thoughts and the reaction (your behavior). If you want to learn to do that reliably, you have to learn to meditate. In short, studies done on meditation have shown that in as little as 8 weeks gray matter in the prefrontal cortex increases. In the amygdala (the part of the brain responsible for stress), the gray matter actually decreases, which then leads to improved focus, increased working memory, curbed impulsivity, and much more of course. But those three are, by themselves, some of the biggest issues we have as traders. When stability of mind is cultivated through meditation, it’s bound to affect the way you trade because, remember, neuroplasticity makes it that when a habit of the mind is worked upon and reinforced, it becomes the norm of the mind. Calmness, resilience, patience, all those are qualities but they’re also habits, and when they are cultivated, they become more natural responses. I thought this last step would be better expressed in video format. So here you go. I am struggling with this right now. Thank you for these concrete steps to use today in order to help improve my trading. It amazes me how all traders seem to experience the same things on their respective journeys to become consistently profitable traders. Thanks for the comment Scott. I’m glad you’re finding the post useful. Yes, it’s a human nature issue. Trading is so counter-intuitive on many levels, and so it challenges us and our inherent predispositions. 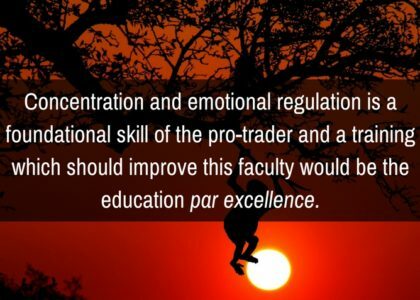 But as you practice the right behavior; as you practice cultivating the right states of mind, trading becomes easier and easier.